Climate Common Sense: Huhne's exit gives Cameron a chance to end scourge of wind turbines! The theory of man-made global warming is nothing other than a scam based on dodgy computer modelling, misrepresentation of scientific evidence and outright frauds. For the past ten years there has been no warming of the climate. It was warmer back in the Middle Ages. Hundreds of climate‑related scientists, among them some of the most distinguished in their fields, have been saying for years that the theory is simply nonsensical. Despite his own history of green gimmickry, the PM must now use the opportunity of Mr Huhne’s departure to listen to the wind-farm rebels for reasons rather deeper than merely heading off a trying back-bench revolt. For the wind-farm policy is as disastrous as it is farcical. 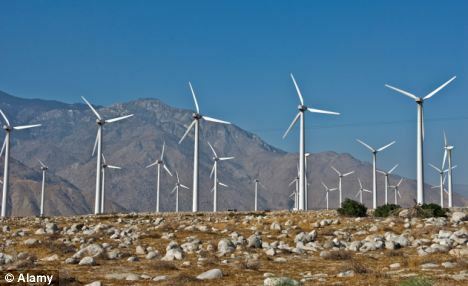 Not only are these huge turbines an environmental eyesore, they also produce no energy if the wind is not blowing. But even more ludicrously, if the wind blows too hard, they have to be shut down. So wind power has to be supplemented by gas-fired power stations — which discharge into the atmosphere yet more of the carbon dioxide the turbines are meant to help reduce. Then there are the added costs. Wind power is three times more expensive than normal-tariff electricity — a burden which is dumped on households which are already struggling under the effects of the recession. While the electricity companies and landowners who rent out their land for turbines can earn millions of pounds from the policy, it has so far added some £52 per year to the average household electricity bill. It's educational to have a look at http://www.gridwatch.templar.co.uk/ which shows in real time the state of the UK electricity grid. There you can see how little of the total demand is supplied by all those ugly expensive windmills, even when the wind is blowing.